Practice the questions given in the worksheet on multiplication table of 25. The questions are based on finding the product using the multiplication table of 25. 1. Count forward by 25’s from 25 to 600. 2. Count backwards by 25’s from 600 to 25. 4. Find each product using above multiplication table of 25. 5. Find the distance walked by a boy in 25 hours, if he walks at 5 km in each hour. 6. 8 note-books are sold at 25 dollars each. Find the total money obtained by selling these note-books. 9. (i) What are 25 twos? 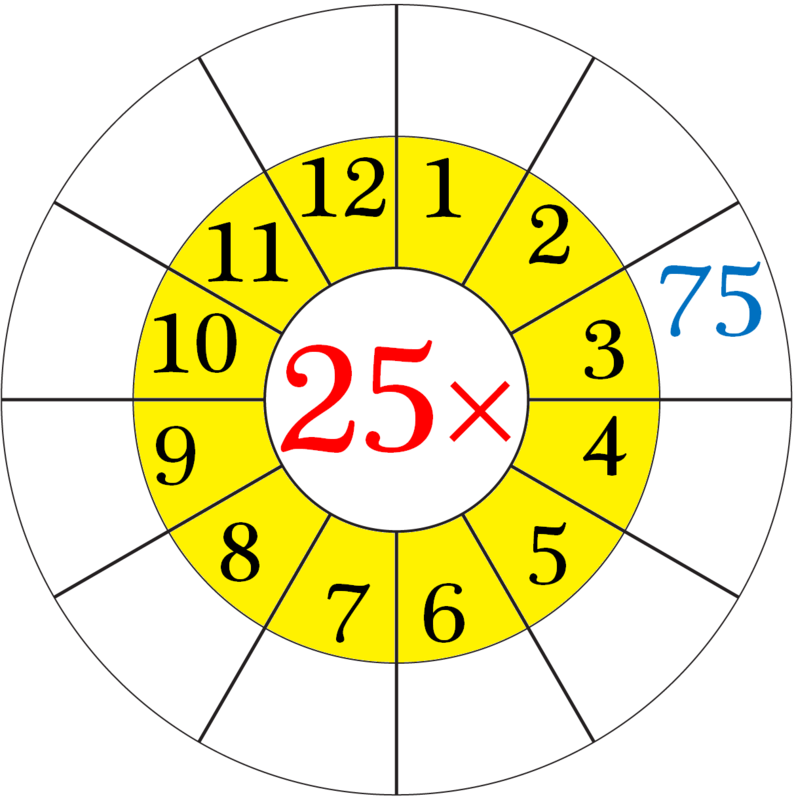 (v) What are 3 times 25? (ix) What is 25 multiplied by 2? (x) 9 multiplied by 25? 10. What does 25 × 4 mean? What number is it equal to? 11. If length of one bed-cover in 6 m, find the total length of 25 bed-covers. 12. A vendor sales vegetables to 25 customers per day. He can sell vegetables to how many customers in 10 days? 13. (i) How many twenty-five’s in 125? (ii) How many twenty-five’s in 175? (iii) How many twenty-five’s in 225? Answers for the worksheet on multiplication table of 25 are given below to check the answers of the above multiplications. 1. 25, 50, 75, 100, 125, 150, 175, 200, 225, 250, 275, 300, 325, 350, 375, 400, 425, 450, 475, 500, 525, 550, 575, 600. 2. 600, 575, 550, 525, 500, 475, 450, 425, 400, 375, 350, 325, 300, 275, 250, 225, 200, 175, 150, 125, 100, 75, 50, 25. 10. 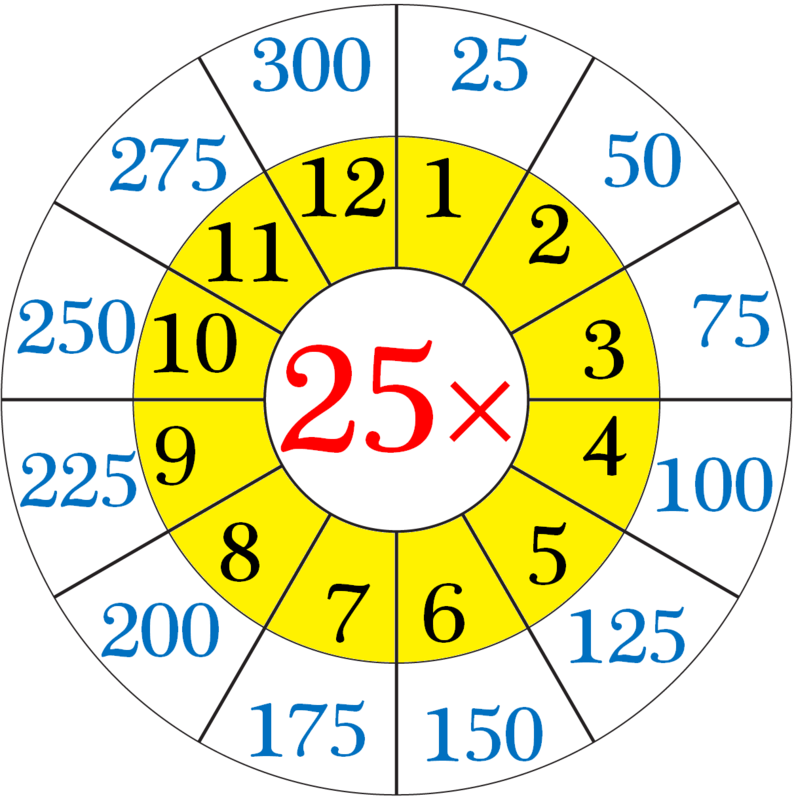 25 × 4 means that the 25 and the 4 are multiplied together or ‘twenty-five fours’ or ‘twenty-five times four’.